Every year after 12th August it is crayfish party time (kräftfest, literally crayfish feast) in Sweden. sweden: Crayfish have been eaten in Sweden since the 1500s. For a long while, only the aristocracy enjoyed these delicacies, as popular suspicion of shellfish was widespread. Originally, crayfish meat was used for sausage, ragout, patties or puddings. 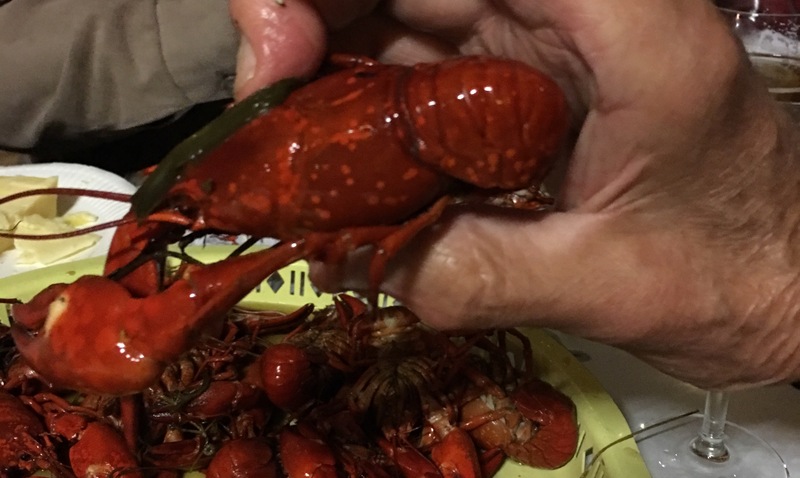 I attended my first crayfish party of the season yesterday – and very enjoyable it was – but not because of the crayfish. I find crayfish bland. It is a strange animal without the delicacy of shrimps or prawns and without the strength of lobsters. It is a lot of very fiddly work for very little meat. The predominant taste is of dill (which is not my favourite herb). Nearly every crustacean I have ever eaten is superior in taste to crayfish – shrimp, prawns, crabs, soft-shelled crabs …. . But it is one particular custom, a behaviour, which makes the crayfish party such a blast. But the real secret of the crayfish party is that one must wash down every crayfish with a snaps (schnapps). One is expected to burst into song. Naturally every song must be accompanied by a skål, and the songs get shorter and more frequent as the night wears on. The bread and cheese and Västerbottenpaj, also usually available, takes care of hunger. It also provides for some absorption of the alcohol. I try to hold with traditions. I tried to respond properly to every skål. A shortage of glasses meant that I even had to pour some of my snaps away since we were going to finish with whiskey. (Fortunately I had my my coffee available to pour the snaps away.) But since I don’t much care for the taste of crayfish, I only had eight last night! This entry was posted on August 18, 2016 at 8:23 pm and is filed under Behaviour, Sweden. You can follow any responses to this entry through the RSS 2.0 feed. Both comments and pings are currently closed.